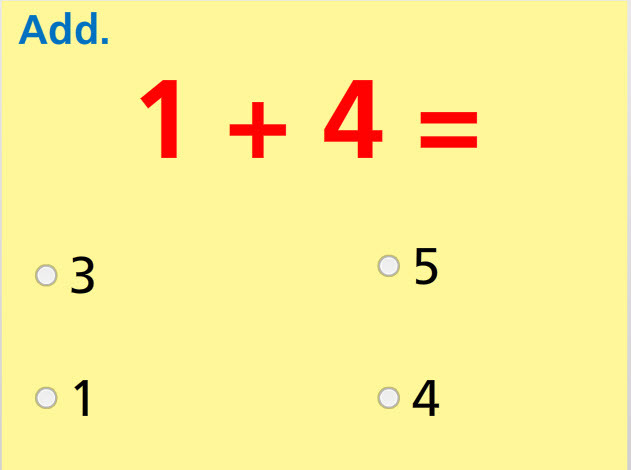 In this math test, students will show how well they can add two numbers that sum to 5 or less. This test is made up of multiple choice problems, and several drag-and-drop questions. The problems are designed to test a variety of number combinations such as 1+1, 2+3, etc. Students can answer problems using a variety of methods such as mental math, counting their fingers, or counting images or pictures. This online activity is suitable for kindergarten and first grade students. Return from this Add Two Numbers- Sums to 5 Math Test to the Elementary Math Tests , Kindergarten Math Tests webpage, or to Math Tests.